City Swiggers Einstok Beer Tasting Event - Oak Beverages Inc.
City Swiggers Einstok Beer Tasting Event, Wednesday, December 5th, 6pm-9pm. 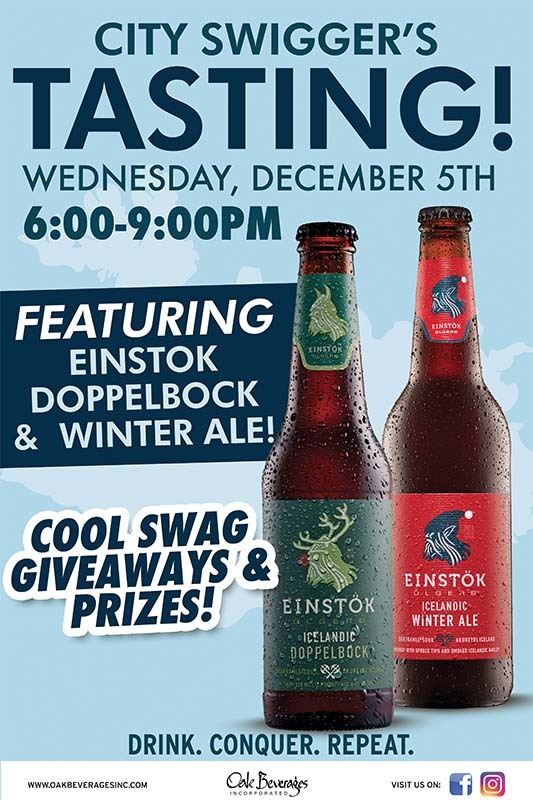 Featuring Einstok Doppelbock & Winter Ale! Cool Swag, Giveaways, & Prizes! City Swiggers is a craft beer shop & tasting room in NYC offering 14 beers on tap and more than 800 bottled beers. Enjoy a pint or grab a growler to go. The best selection of craft beer in bottles and cans in the city. Otherwise, an excellent craft draft selection from fully rotating taps. We’re a beer store and a beer bar in one. We have 30 seats with tables for those who want to enjoy a pint or a flight on premises. And we have about 800 beers in bottles (to go) on the shelves. Check out our tap list, above–at this Web page–or on the black board on the wall across from the bar in the store. As for the bottles, we have domestic beers in the front (west wall, sorted by region/brewery) and imports and ciders in the back. The cooler has a little of everything, sorted by style. Posted in Featured Promo, Giveaways, Prizes.